Medha starts the hangout with exciting updates from the development team: the release of RNode v0.6.1 and a continued increase in the Tuesday node testing sessions. 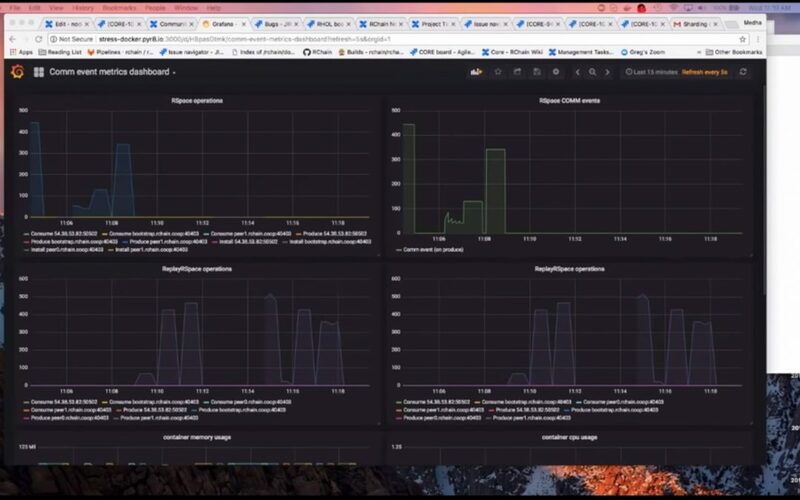 Following this is a demo on the Grafana dashboard by Medha and proof of concept audio demo by Kayvan. John West gives the Reflective Ventures update, stating the staking amount limits and discounts. They are glad to welcome Ned Robinson to the solutions team. Lots of updates from Pithia on deals coming across to them. Lawrence is scheduled to have an interview with Washington state senator Reuven Carlyle at the Blockchain Seattle event to discuss the role of government and public-private partnerships. If you’re interested in becoming a validator for the RChain network, please register your interest or email staking@rchain.coop for more information. Someone will get back to you within 48 hours. Get a headstart on the process by becoming a member and working on your hardware provisioning and maintenance plan. Find details on how to become an RChain validator in this post. The developer RHOC-REV page is the only official channel for announcements and information related to the token swap. Sign up to receive email updates. It’s not too late to register for RCon3. Get about a 50% discount if you pay with ETH. If you can’t be there, there will be a livestream of tracks 1-5. Interested in pitching at Pithia’s San Francisco event? Send your requests to pitches@pithia.com. Focusing on bugs and stability as the highest priority. Node testing is progressively successful and Medha is on triage every Tuesday after node testing. Sharding and economics for consensus are not ready. These will be part of RNode 0.7. The team will be delivering features on the testnet all the way up to November. Medha is working on proposing release criteria, and will work with the development team & Co-op board to settle on these criteria. The registry is in implementation. It will support UUID and public keys only. Planning on compressing the block data before sending it. The block approval protocol for genesis block is in review. Integration of the block store is in review. This is a large PR that depends on the genesis block approved PR. Unbonding contract in review. It’s not going to be integrated in time for testnet but there will be a fast follow-on with it. Error handling in Casper in review. Addressing issues in RSpace relating to thread management and performance. Discovered an LMDB single writer limitation, so moving to a hybrid solution where the in-memory hotstore and LMDB are used. Implemented an update frame size to support 108 MB block size by default. The size is also configurable via command flag on node startup. Made some performance harness improvements. There is a Grafana dashboard that can be used for testnet. Building gRPC clients and API for client data retrieval. RNode 0.6.1 release has been updated. RHOC to REV page has been updated. Sign up for email updates. Proof of concept allows music to be stored on the blockchain and any device. Android, iOS, PlayStation etc. can subscribe. It allows deployment of RChain code on tiny cheap devices such as a Raspberry Pi. By installing RChain on a small Raspberry Pi, we can store IoT data onsite to the blockchain. Those interested in being a validator should register their interest. Registration for RCon3 is still ongoing. There is a registration discount if you pay with ETH. Adrian Belew Power Trio and Echo Test will perform a concert for attendees on the 5th of September. Pithia’s agreement with the co-op has been signed and updated. 9 of 18 companies in the pipeline are under due diligence. ERP for mining. This company is building software that manages the different aspects of mining: mining pools, asset management, and all things related to how operations are run, measured, and managed. IoT security for blockchain. This company has developed a blockchain implementation that allows for securing the chipsets that manage IoT devices. They’ve already established partnerships with key chip manufacturers. DEX – This distributed exchange is already live and building operations to allow wallet-to-wallet swaps of curated tokens on a blockchain. They’ve announced office hours with CoMotion, a tech transfer organization at the University of Washington. The team will be attending the Blockchain Seattle event. Lawrence will be interviewing Washington state senator Reuven Carlyle at the Blockchain Seattle event to discuss the role of government and public private partnerships. Rholang educational course material for a local coding academy in Washington state is looking for teachers. The team is in connection with a smart ticket company. They have built an ERC721 token for tickets to be sold just like Ticketmaster, StubHub. Building a strong relationship with Amazon Web Services for the community. CRM system is set to manage validator inquiry responsibly. The team introduces Ned Robinson to the co-op. He will be assisting the solutions group to help signed companies technically deploy on the RChain platform. The staking amount ranges from a minimum of $1500 to $1,000,000. John West shows a competitive analysis of interest paid on stake by other PoS projects. The team came up with a 15.26% token sale discount for a nominal yield of 12%. The idea is, instead of minting new tokens or taking inflationary actions, tokens are sold at an additional 15.6% discount, with the benefit of a 12% nominal yield. The total return for the lock up period (18 months) compared to other staking competitors shows that RChain is paying 18% – 20% which is highly competitive.